Tip: Allow the beef to enough time to cook slowly in your oven so it can become meltingly tender! Welcome back foodies! We’ve got a real treat for you this month – A Beef Stew with Spring Onion Mash. This delicious dish is perfect for all the family or ideal if you’re having friends over for dinner and nice glass of red wine. For the stew, we’re going to make sure the beef is lightly seared in olive oil first to hold in all the flavours. Then after some time in the over the meat becomes amazingly tender. You’ll be wanting to dig back in for seconds! When working on new dishes at our Innovation Centre our chefs use the best food ingredients so that everything not only tastes fabulous but is healthy. So, when you’re picking up your supplies for this one be sure to find nice fresh produce. Without further ado here’s what you’re going to need…. Preheat the oven to 180˚C/gas mark 4. Season the beef generously with salt and pepper. Heat 2 tablespoons of olive oil in a large ovenproof pan (with a lid) over a medium-high heat. Once the pan is hot, add enough beef to cover the base of the pan. Brown evenly on all sides, then remove from the pan and set aside in a large bowl. Repeat with the remaining beef. Add 100ml of roast beef stock to the pan. Use a wooden spoon to scrape up the caramelised pieces stuck to the pan. Allow to simmer gently for 2-3 minutes, then pour over the beef. Add the beef and juices from the bowl back to the pan, along with the wine, stock, tomato paste and thyme. If the beef is not covered, add more stock or wine. Bring to the boil, then reduce to a low heat and cook for 2 minutes. Cover with a lid and place in the oven for 2 ½ – 3 hours, or until the meat is very tender. Meanwhile, place a frying pan over a medium heat and add a tablespoon of oil. Once hot, add the Shallots and mushrooms and fry until a light golden brown colour. Remove from the heat and set aside. Remove the beef from the oven and add the onions and mushrooms. Place back on a low heat and simmer until the sauce thickens, approximately 20 minutes. Add a pinch of salt and pepper and continue to simmer. 8 Maris Piper potatoes, peeled and cut into chunks. Once the potatoes are tender, strain off the water and return to the pan. Add the milk, butter, salt, pepper and chopped parsley & finely sliced Spring Onions to the pan and mash well. To serve, spoon the mash onto the centre of each plate and press down gently to create a well in the middle. 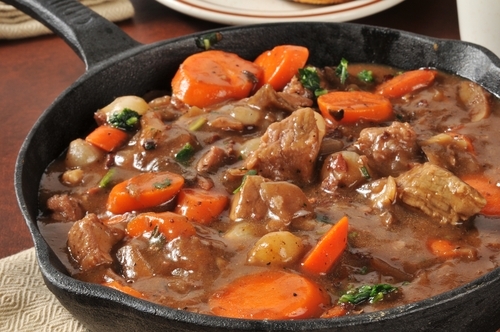 Ladle the hot beef stew into the well and serve immediately. Thanks for dropping by, happy cooking and enjoy your Beef Stew! You can keep an eye on your latest news for more tasty recipes and please contact us if you need any more information.